So last Tuesday was Callixte’s birthday, as I couldn’t find him something he would need I asked him if he had something in mind… He told me none of his camera bag would fit his Mamiya Universal Press and therefore he would like to have one made specifically for it… So here I was thinking of how I could do that. I did a print/drawing of the camera that I got printed at Impressionne Moi (I can only recommend the company, they are friendly and very helpful) and I started to work on toiles. 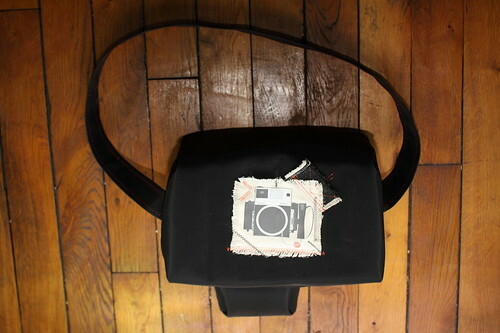 A week later here is the final bag finished, in which the camera fits perfectly. The bottom is toughen with Plexiglass and the inside is well padded. The external fabric is waterproof (some kind of plastic/PVC/fake leather) and it is lined with black denim. Our collaboration with Antoine Leven has been published ! j’adore!! !oh là là…si thomas le voit je suis mal….incapable de faire ça moi!! 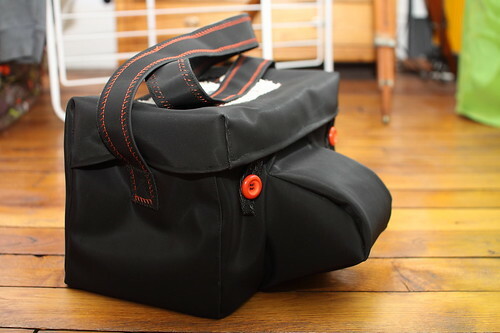 Pfff, je m’arrache les cheveux pour faire un sac pour le nouvel appareil de Tom…et la forme carrée avec une fermeture…bref c’est pas mon fort!! !Tu as des conseils? humm c’est quoi comme appareil ? Après tu peux t’inspirer de sac photo classique non ? Pour le patron part du principe que c’est un cube si tu fais un sac carré ? !